This Half Column is designed to fit our 9" half column capitals and bases. The overall width is 9" with a height of 79". 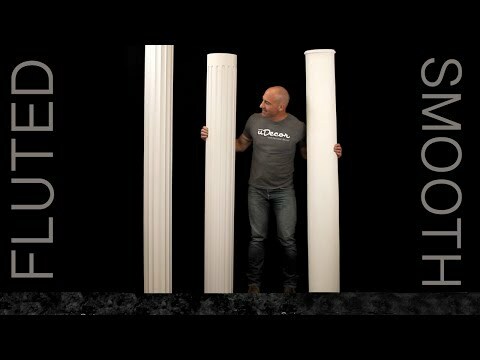 uDecor columns are manufactured with a dense architectural polyurethane compound (not Styrofoam) that allows it to be very durable and 100% waterproof. This material is delivered pre-primed for paint. It is installed with architectural adhesive and/or finish nails. It can also be finished with caulk, spackle and your choice of paint, just like wood or MDF.A major advantage of polyurethane is that it is safe to install in rooms with the presence of moisture like bathrooms and kitchens. This product will not encourage the growth of mold or mildew. Other products reviewed on this order: HC-8023-B Half Base 9", HC-8023-C2 Half Capital 9"
Other products reviewed on this order: HC-8023-B Half Base 9", HC-8023-C1 Half Capital 9"